Although the WordPress interface used for adding or editing a post in WordPress is nearly identical to adding or editing a page, there is one major distinction; a post is typically blog or article oriented and displayed on a page that shows all posts (or a category of posts) on a page in reverse-chronological order. This format is more appropriate for things like ‘latest news’, blogs and articles, as opposed to the more static pages of your website. To create a new post, log in to the WordPress Admin area and choose Posts > Add New from the admin menu on the left. Type the title of your posts in the first field, keeping in mind that this typically is displayed as a H1 or H2 heading tag on the public side of your website, which is important for two reasons: it tells the reader what the article is about (like a newspaper heading) and also tells search engines what the post is about. In the main content area, type the content of your posts. Use the editor menu to create headings (H1-H5), paragraph text, and links to format your post in an easy to read manner. Tip: If you don’t see the Heading and other formatting options, click the Show/Hide Kitchen Sink button. You can optionally associate your post to one or multiple categories. Depending on how your website and menu is constructed, visitors to your website may be able to search by category or view a page that only shows posts that are associated with a particular category. In most cases, all blog posts (or excerpts) including the ‘uncategorized’ category shows on the main blog page. Tags are similar to Categories, but are less structured since they don’t use a parent/child hierarchy like Categories do. 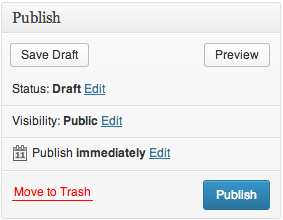 When saving your post, you have the option to save as a draft or to publish your post. You can also schedule a post to automatically be published at a specific date and time, change the visibility (password protect) of the post, move the post to the trash, and preview the way your post will display on the public side of your website. To edit an existing post, choose Posts > All Posts and click on the post you wish to edit. You can alternatively use the ‘Quick Edit’ feature if you want to quickly change the title, change comment capabilities or categories, and other attributes.